Blog - Our Biggest Announcement Yet? Today, I’m excited to announce that we accomplished this goal. And the proof is here in the flesh! For the past 6-9 months, we’ve been working diligently on a new line of 1 oz silver rounds: the Landmarks of Washington series. Monument Metals is located in the Washington DC metropolitan area and we wanted to celebrateour nation’s capital. Our challenge was to find an artist, engraver, and mint that could issue these rounds with stunning detail and superb eye appeal. After numerous revisions, I’m thrilled with the result – and you will be too. We just received the first shipment of brand new Monument Metals Landmarks of Washington rounds. This first issue in the series features the United States Capitol rotunda on the obverse along with the Washington skyline on the reverse. Both sides are meticulously engraved with exquisite detail; the round truly captures the splendor of the capitol. The open areas are prooflike and give the round striking cameo contrast. Choosing the right mint was crucial too. As you may recall, the Golden State Mint has been producing some of the industry’s most beautiful silver products as of late. Their Aztec, Texas Alamo, and British Trade Dollar rounds have been wildly popular in the marketplace. Given their track record and excellent reputation, it was an easy choice to have GSM product the Landmarks of Washington rounds. This means the rounds are more than just good-looking; they’re also made to the highest quality. 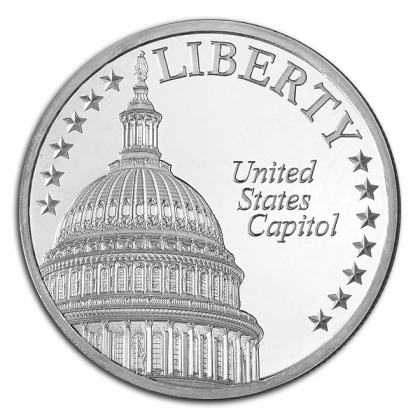 The first edition in the series, The Capitol, will have a maximum mintage of 50,000 pieces. Although we anticipate it will develop collector value down the road, we are launching the round at ultra-low bullion pricing. This is in keeping with our mission to provide items that have the collectability of a numismatic item and the value of a bullion piece. Your cost on the Washington Landmarks Capital round is as low as 79c over spot! We can’t think of a more cost-effective 1 oz silver round, let alone one that’s more attractive. Take advantage of our special launch pricing and add this unique silver round to your holdings. This is a fantastic way to own low-cost silver in a truly beautiful form.